Oculus Video on the Rift supports spatial audio through side-loading. Oculus Video app on the Rift is not supported with streaming content. Only video files which are saved on the computer can be side-loaded and played back with spatial audio. Videos which are streamed in the Oculus video app will still be played back in stereo. To read more on how to side-load videos in the Oculus video app on Desktop, read https://support.oculus.com/help/oculus/1707817122769530. The supported file format for side-loading into the Rift is different to the file created for upload to Facebook, or for side-loading into the Gear VR. We have added extra options in the FB360 Encoder application, more on this below. All videos that are side-loaded on the Oculus video need an extra file with parameters defining playback, regardless of whether the file has spatial audio or not. This is different than the side-loading support available on the Gear VR, which relies on a particular filename convention to recognise the type of 360 file being played (360, stereo, etc). The parameters file makes it easier and less confusing to define the playback options. 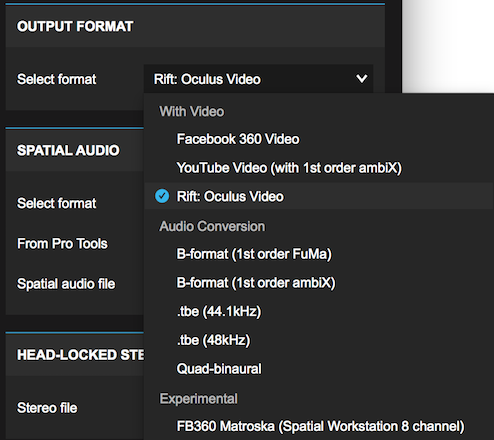 Starting from FB360 Encoder V2.1, you can now choose Rift: Oculus video as an export option. This will automatically create an MKV file with spatial audio and the additional text file required for side-loading. Both files can then be added to the “Movies” directory on your PC. 2D — Full screen 2D. 3D —3D with left and right images in side-by-side anamorphic format. 3DLR — 3D with left and right images in side-by-side anamorphic format. 3DLRF — 3D with left and right images in side-by-side format. 3DTB — 3D with left and right images in top-to-bottom anamorphic format. For more details, please read the Oculus Video documentation.